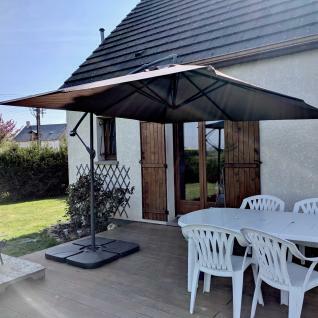 Square Hardelot cantilever parasol 3x3m. With its square canopy and offset base, the Hardelot is a modern addition to any garden. 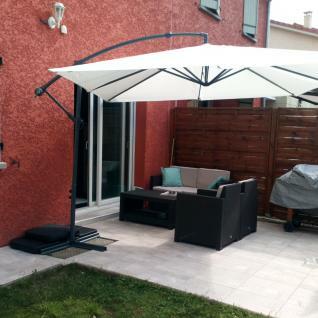 With a simple, refined design, this chic parasol will blend right into any setting. The Hardelot parasol is also extremely practical. It's easy to open and close thanks to its anti-reverse crank. 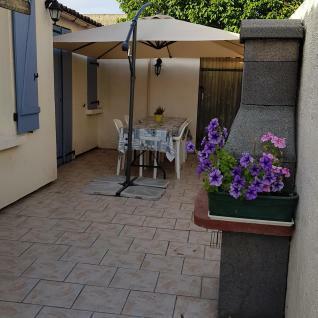 The Hardelot has a awning at the top that allows air to flow and prevents the parasol from being caught by the wind. Its cross-shape base provides added stabitity. It can be anchored to the ground or weighed down with slabs. 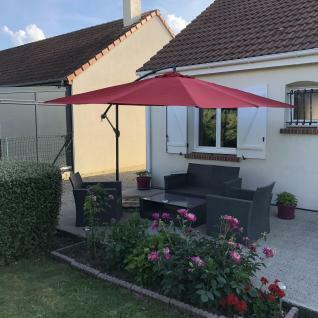 The Hardelot parasol is very sturdy thanks to its reinforced steel frame and metallic fittings that have been coated with paint suited to outdoor conditions. The crank and riveted joints are made of plastic. This means the parasol is long-lasting and easy to maneuver. The polyester canopy (180g/m²) is coated with a water-repellent treatment which makes the canopy waterproof. We stock a protective cover that's compatible with this parasol. Click here to see it in our catalogue.